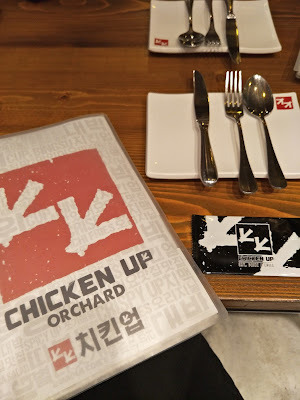 After my first visit to Chicken Up some time back while on a food trail event, I finally got to return to their newest branch located at Centrepoint along with fellow bloggers Oyhz, Michhysaurous and Susan Wong. I'm really thankful to be exclusively invited to try out their latest addition to the menu, the snow squid topokki! But first let's get back to Chicken Up first. 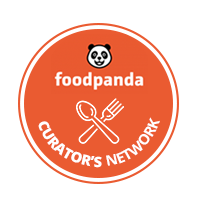 Do you know that they first started up in 2010 in Singapore with a vision to provide a casual dining experience and introduce some of the authentic Korean food here, and it's their 7th year with us this year! 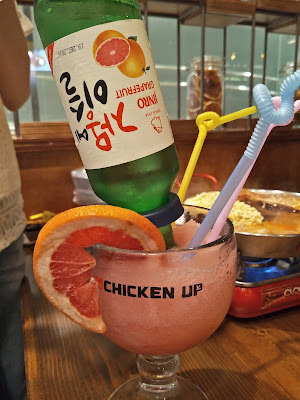 If you've tried their usual sojurita before, you'll fully understand the 'soju problem' when you get to the bottom of the cup, when all the syrup infused portion of the drink was gone and all you've left with is the bitter soju straight from the upturned bottle. But this eliminated your woes! Replacing the usual soju with grapefruit flavoured sweeten soju, you're now assured with a yummy sweetness down to your very last sip! Seriously, how can you not want to order every single one of them to take a group picture? While the strawberry banana looks really pretty in a dusty, creamy pink colour, it tasted a lot more like a banana smoothie instead. Too little strawberry taste, probably because banana by itself usually overpowers all other tastes. I've never had a banana-something flavoured food that didn't taste all banana-ish. Have you? Probably one of their most popular dishes, Chicken Up's bulgogi fries is made up of crispy golden fries piled up and topped with bulgogi (beef marinated in soy sauce), drizzled over with white garlic sauce and added with spring onions and corianders to garnish. I didn't try this as I do not take beef for religious reason, but I do love their kimchi cousin! 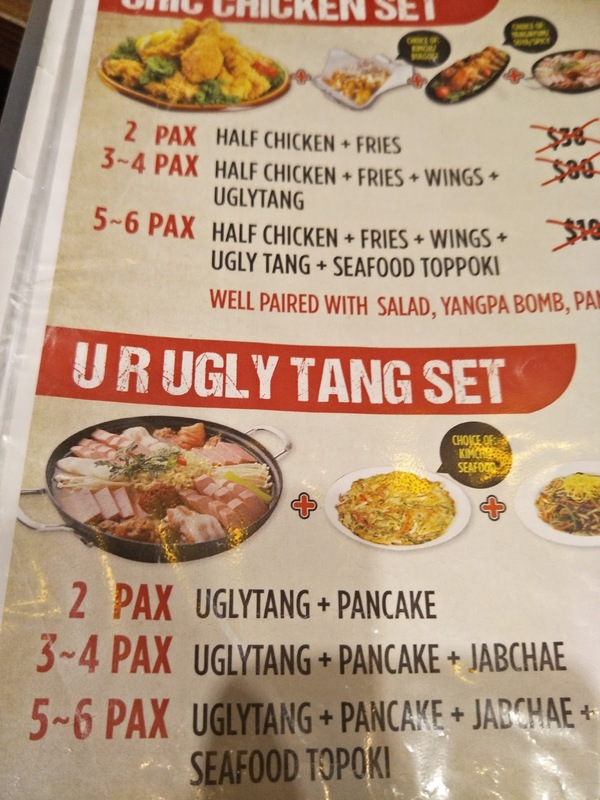 The reason why Chicken Up named it Ugly Tang is because.... it's ugly. If you're an instagram-foodie, I reckon you will understand. But not that much of an understanding from me though, because I'm a huge fan of budae jjigae so they look good in all angles to me. And before you start to think I'm trolling on you.... It's really called Ugly Tang. 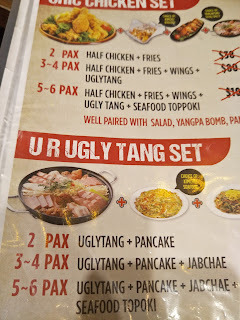 They even have a U R Ugly Tang Set! Well, that was the before pic and it takes you about 15 minutes of simmering to get to this stage. Full of spams, chicken franks, korean chewy rice cakes, enoki mushroom, and ramyun, how can one not fall in love instantly with this incredibly tasty (and unhealthy) pot of yumminess? Chicken Up has also added something unusual into their Ugly Tang, and that's (if you haven't seen it at the top right hand corner of the pot) macaroni! The macaroni does taste a little bit strange (especially if you aren't a fan of it when it's not drenched in cheese) in the jjigae, but it might just be me for the feedback Chicken Up received on the addition was quite a good one. I'll say, try it out and decide for youself! But do note that this will serve two pax provided you ONLY order this stew. Servings aren't that little, so it can probably feed up to 4 pax if you'll prefer to have slightly more dishes on your table. The first word that came from all of us when this baby was served was, "WHOA!" And the taste of this was whoa indeed! A huge platter with topokki (spicy rice cake) in the middle, topped with one whole fried snow squid, and surrounded by side dishes such as caramelised kimchi, corn cheese, melted cheese, steamed egg and kimchi bokkeumbap (kimchi fried rice), this is as good as a mini buffet served on stove. And don't worry about that snow squid, for it shall be cut nicely for you at your table. The squid is tender, slightly chewy and tasted really fresh. If you're quick-handed enough to not let the fried batter get utterly drenched in the flavourful topokki sauce, you shall be rewarded with a mouthful of fresh seafood that's crispy on the outside and succulent on the inside. The topokki was super yummy as well, just spicy enough for you to feel the shiokness and yet not too overpowering. Having their watermelon bingsu once again after 2 years, still as good! And now, do you wish to have a tasty of these yummy, creamy dessert with a friend? So, it's going to be a bingsu giveaway time! I have with me TEN numbers of 1-for-1 Korean Bingsu voucher for giveaway, courtesy of Chicken Up! Just head down to Chicken Up's instagram account (HERE) and FOLLOW, before coming back here and leave me a comment with your instagram handle and email by 8th March. ps. I will also be holding another giveway for a 4-piece soya chicken wings redemption voucher on my instagram at a later date, so do keep an eye for it! For more information, visit their facebook HERE. I recall reading your first Chicken Up article. That Ugly Tang seems expensive, but I think we would all like to try it out. The soju and the spicy we will pass on. That topokki caught my attention. Was it good? The light bulb drinks looks really cool. Chicken Up looks like a nice place to eat. And with funny menu names, foodies will definitely have fun eating here. Those lightbulb drinks are just awesome!!! The watermelon bingu just looks divine! Being a veggie I don't think I have too many options here though! Looks tempting!!! Light Bulbs look so innovative. Nice varieties they have. I like to eat all of them! Very saliva aggregating foods.